We as photographers can make use of reflectors to manipulate the light, and often as an alternative to extra lighting or flash units. Small reflectors are useful for providing infill light for close up and macro photography, middle sized ones will lighten under chin shadows in portraits and can be used often to focus more light into specific areas of our photographs, while larger ones can be used to soften shadows generally, provide a balanced light when shooting with available light from a window or take the place of a flash unit in a studio lighting set up. There are a number of advantages to using a reflector instead of a flash unit, the lighting is far softer and not inclined to produce a second set of shadows, light from the reflector, unless you choose a coloured one, is the same colour as the source light, you can see the effect when you position it, it is easy to metre and understand, it does not make people screw up their eyes or react, has no batteries to run flat and you don’t have to wait for it to recharge before taking the next shot. A lot of wildlife will not run from the light from a reflector while they may if you flash lights at them. The down side is that you have to have a way to hold them and may need to put them into position and may then not be able, easily, to move them for example when photographing birds on a bird table. Reflectors may also allow you to get more selective lighting where you want it, and achieve special effects. The movie industry you may have noticed likes to throw light across the actors face in a streak illuminating their eyes and some wedding photographers try to get a specific shot where they have a bride in the shadow, lit using a reflector to throw sunlight across their face. With both soft lit window shots and character lighting, reflectors make the whole process far easier. Used with the Nikon Creative Lighting System where our flash is far more controllable, reflectors can both cut down the number of flash units we need and soft fill shadows, as well as helping us to control the contrast of the shot. We can also bounce our flash off the reflectors, or though them if they will also act as diffusers. They are easy for most people to use as the position is not extremely critical, the effect visible and most people quickly get the hang of looking at where the light is coming from and therefore the position they need to put the reflector. We have a variety of options, ranging from the very simple, a piece of white card or paper to elaborate special made equipment and stands, so lets investigate some of the options. Reflectors can be items that we just have to hand or are in place, items that can be used to act as reflectors or reflectors that we make or buy. The simplest reflector that many will use without even thinking about it is a ceiling that they bounce their flash off. Many easy to obtain items can be used as reflectors including a piece of white card, an artists canvas, or disposable serving plates. Some paint larger items like pieces of hardboard or a spare internal door. An old movie or slide screen also makes a great reflector. Recently one client told us of a diffuser/reflector he had made using Perspex that is used as a background for sign writing. The problem with many of these are they are not very compact and mobile and for this reason we often purchase reflectors that are light weight, and compact that we can take with us. The reflectors that we buy come in a number of formats, including those that unroll and fit onto a frame or stand, those modelled on an umbrella, and those made of metal hoops covered with material that folds into three loops and then fits into a manageable sized bag. These are circular or elliptical, and come in many sizes. Some have two different coloured sides. The small targets you may have seen us using to set white balance or deal with difficult exposure conditions, have a reflector on the back so we always have this with us. Some of these hoop based reflectors are known as bottle tops and they are made up of a hoop covered in material and a zip on cover that is reversible, in total you have five in one, the central part, which is often semi transparent acting as a diffuser and then four different coloured sides. This then provides you with a diffuser, white, silver and gold reflectors and a black version that stops reflections occurring. The down side when used outdoors is that they can catch the wind, so we often need an assistant to hold them for us. Inside we can prop them up or obtain a reflector stand. Unfolding reflectors are designed to be used on a stand, while hoop based reflectors can be held with a special arm that fits onto a lighting stand, this has clamps designed to hold the hoops and can hold them at any angle. We have one middle sized hoop reflector and 3 larger bottletops as well as some frame based ones. Indoors often we are inclined to use the larger bottletops but outside we are more inclined to the smaller one or the middle sized reflector. We use a stand that can hold any of these, but don’t make much use of the stand based folding reflectors. 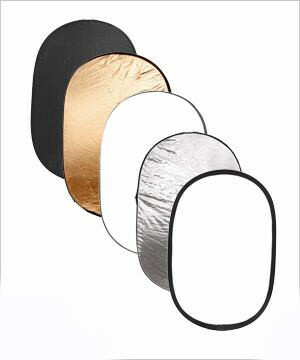 Some small to middle sized hoop reflectors are shaped to resemble a rounded off triangle with handles that are designed so the photographer can hold the reflector while taking the photograph. Some of these are also available with one or two reversible covers providing many potential uses. A hi-lite is a self supporting background made up of two of hoops, the front one covered with diffuser material and the one behind it inside being a reflector. Usually it is used by shining a light or flash units into the centre, so the front is brightly lit from inside. However without a light being used it is a large reflector. It is available in two sizes, we have the larger of these which is 7ft by 6ft and usable in either direction. These hoops fold down like other reflectors to allow it to be carried in a manageable sized bag. Flash cubes or light cubes are usually hoops that when unfolded allow a covered cube to be set up. The material this is covered in is a cross between a diffuser and reflector so light can be flashed or shone through from the outside but once inside reflects all around providing soft lighting. Again these come in a variety of sizes, the smallest we have is about a foot in each direction suitable for photographing jewellery, while the largest we have is 5ft in each direction. Larger ones are available but given that you and the lights are outside the cube you would need quite a large room to use a much larger one. Most have a zip off door, and velcro fitted backgrounds in a variety of colours. Other versions have bottoms that come out to stand over plants and other removable panels.